In recent times, the telecom operator Idea Cellular is losing subscribers in a big number. One reason for that is the telecom operator is not launching new tariff plans to lure the customers. 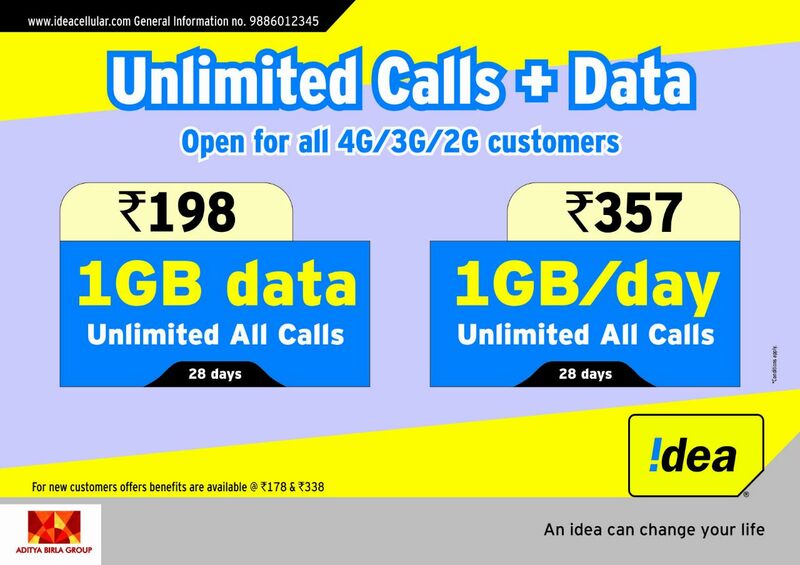 However, Idea has now come up with new tariff plans of Rs. 198 and Rs. 357 to compete with Airtel’s Rs. 199 plan and Reliance Jio’s Rs. 149 plan. Talking about the Idea’s Rs. 198 plan first, it offers 1GB 4G/3G/2G data and unlimited voice calls. The Rs. 357 plan gives 1GB data per day and unlimited voice calls for 28 days. As you can see in the image, both the plans are valid for Idea 4G/3G/2G subscribers, meaning, if you’re a 2G customer, you can enjoy 2G data, and if you’re a 4G user, you can enjoy high-speed 4G data. Also, the voice calls are limited to 300 minutes per day and 1200 minutes per week. We have confirmed that both the plans are valid for Himachal Pradesh and Andhra Pradesh & Telangana users. Maybe, these offers are valid across the country. Lastly, both these plans are also valid for new Idea subscribers who’re joining the network. However, the price for new Idea subscribers is Rs. 178 and Rs. 338. Earlier today, we reported that India’s leading telecom operator, Bharti Airtel has launched two new plans of Rs. 178 and Rs. 199. With the Rs. 199 plan, Airtel is giving 1GB 4G/3G/2G data and unlimited voice calls for 28 days, whereas the Rs. 178 plan is for new Airtel subscribers who’re making their first or second recharge. Some of our readers also stated that Vodafone is also offering a similar plan of Rs. 178 that gives 1GB data and unlimited voice calls for 28 days. All the top three operators are looking to compete with newcomer Reliance Jio’s Rs. 149 plan, which gives 2GB data, 300 SMS, and unlimited voice call for 28 days. Does the Idea’s Rs. 198 and Rs. 357 plans valid on your circle? Let us know by commenting below.